A fishery with a great reputation – which means it must be good! Weston Lakes in Cambridgeshire is a very popular venue – this normally means one thing, the fishing there is pretty good! With just 25 pegs on offer, this is a fairly small water. 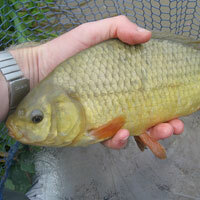 The lake is stocked with a wide range of different species, including a very good head of carp. These carp have a reputation for giving a good scrap, they average around the 5lb mark and go to around the 30lb mark. A great number of fish, including the better carp can be caught quite close in. Avoid the margins at your peril, just make sure you beef up your tackle! The fishing at Weston Lakes is charged at £7 per day. Address: Thorney Road,,, , Peakirk, Peterborough, Cambridgeshire, PE6 7NT.